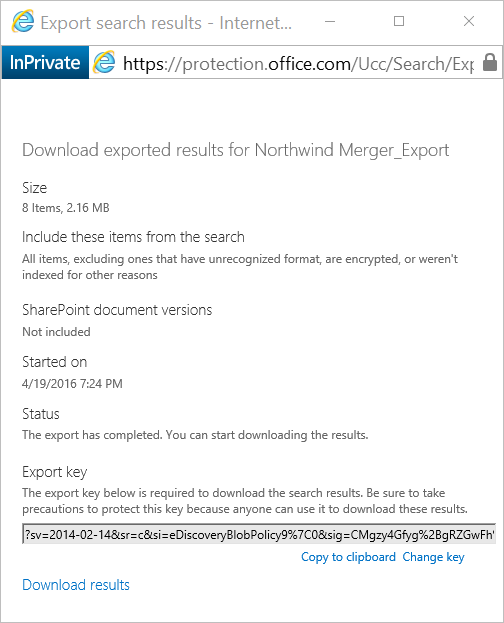 To save you time and make it easier to perform investigations and eDiscovery from one central location, we have released several eDiscovery enhancements to the Office 365 Security & Compliance Center, including case management, search, hold and export. These new eDiscovery enhancements further strengthen the rich set of eDiscovery capabilities already present in Office 365 to help you quickly investigate and meet legal and regulatory obligations from the Security & Compliance Center. The eDiscovery page in the Security & Compliance Center now has an option for case management, allowing you to work on eDiscovery cases without leaving the Security & Compliance Center. Use the eDiscovery case management feature to control who has access to the case, place content sources on hold and associate Compliance Searches with the case. Preserving information is integral to the eDiscovery process. With Office 365 eDiscovery Case Management Holds, you can select the mailboxes, OneDrive for Business sites, SharePoint sites and Office 365 groups you want to preserve as part of your investigation. 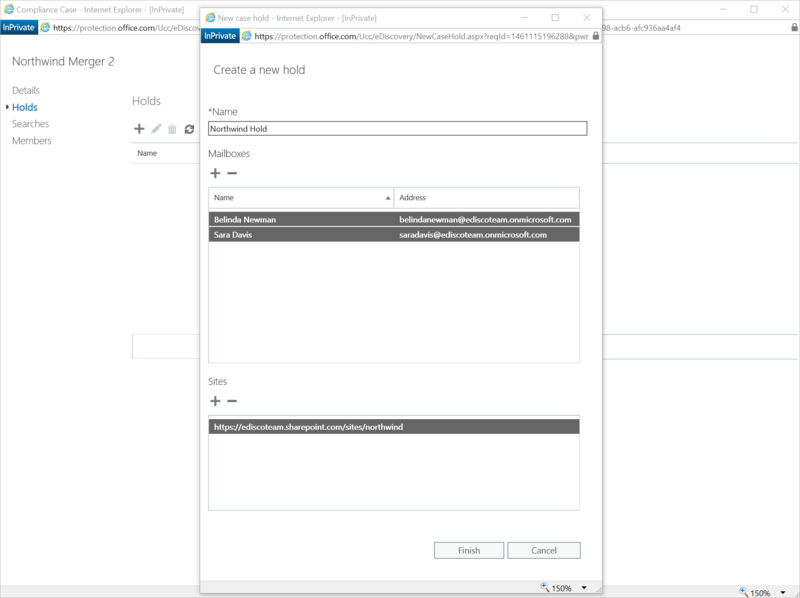 Applying a hold preserves all data in the selected content sources until you release the hold. Content is preserved in place, so people can continue working on their documents and email without any loss in productivity; but behind the scenes, the content is preserved and is available to be searched and exported. Now, in an eDiscovery case, you can create granular searches which allow you to search either a small number of locations or your entire organization. In addition, the searches you create as part of an eDiscovery case are only accessible by people that are part of the case. 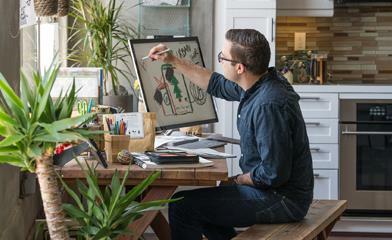 You can search and export data from mailboxes (active or inactive), public folders, OneDrive for Business sites, SharePoint sites and Office 365 groups. Finally, you can also use searches to identify data to be analyzed with Advanced eDiscovery, which reduces the volume of data sent for eDiscovery review by finding near-duplicate files, reconstructing email threads and identifying key themes and data relationships. After completing a search and identifying the data you need, you can export the data to a local drive. 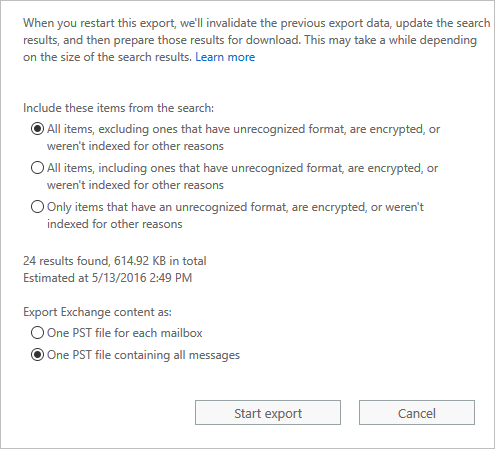 You can export the results from searching tens of thousands of mailboxes—up to 100 GB of data in a single PST export. The ability to search all mailboxes in the organization and export the results in a single PST export, versus multiple PSTs, helps our customers collect email in an extremely useful format for broad investigations. 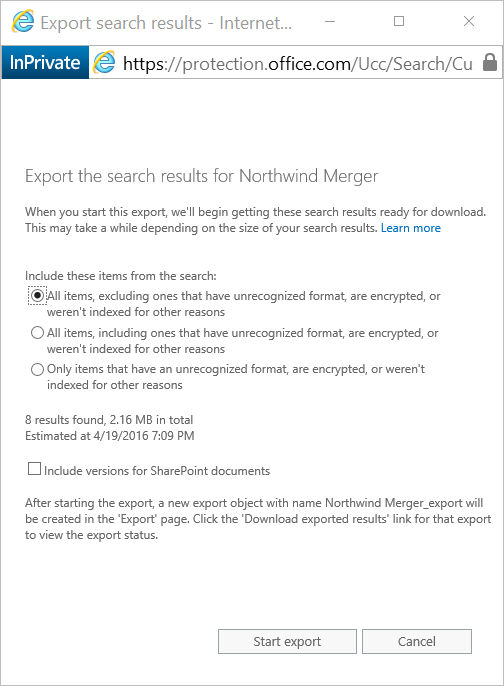 The Export feature also includes new advantages: it maintains the metadata when SharePoint documents are downloaded, no additional permissions setup is required and two factor authentication is supported. To further improve your eDiscovery process, in the coming months we will be delivering additional eDiscovery enhancements, such as keyword statistics, source statistics and export de-duplication, in the Security & Compliance Center. To take advantage of all the new eDiscovery enhancements we have introduced, simply go to the Security & Compliance Center in your tenant.